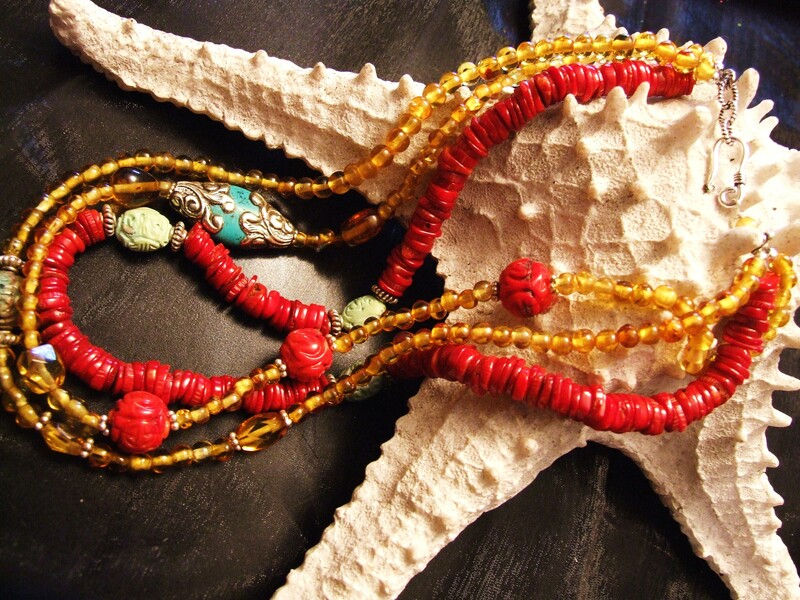 Amber, Red Jade and Turquoise remind me of a beautiful sunrise..
I’ve always been drawn inexplicably to stones. Sometimes I will look up why this particular stone has a certain attraction for me and I will find that it is exactly what I was needing at the time. I feel many times the stone chooses me! Many ancient cultures believe certain stones have healing properties and certain traditions go back centuries. I love the feel of them against my skin and sometimes I feel certain energies from different stones. There is nothing I enjoy more than putting together a necklace for someone that I’m very fond of. It’s truly a labour of love. Ultimately my selection relies on my intuition and heart. For me there is nothing more sensuous than amber and soft gold together. I’m very drawn to amber and amethyst for some reason and enjoy working with these particular stones very much.The ancient Roman writer and scientist Pliny the Elder (23-79 BC) stressed in his work Natural History that amber is not just adornment, but it is also the cure. 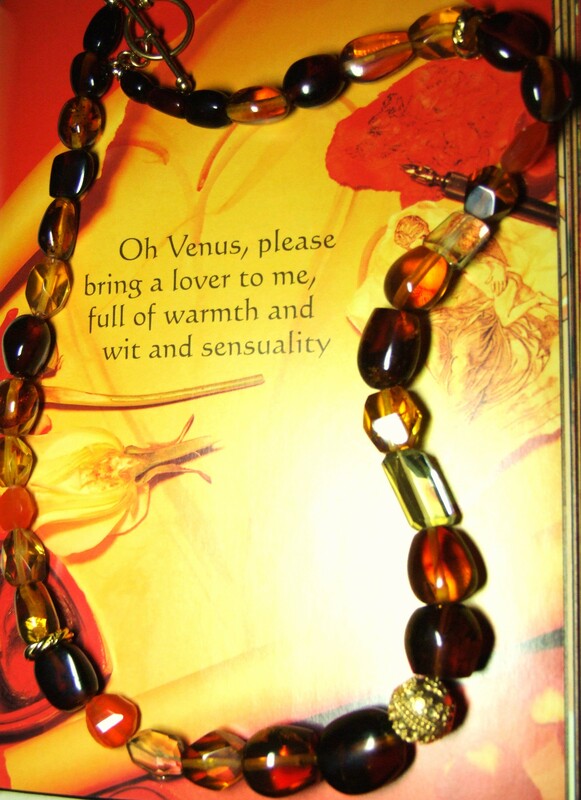 Amber jewelry (they have to touch the body) provides energy, will and determination. Perhaps I’m intuitively drawn to it for the romantic myths attached to amber. A Lithuanian amber myth tells about the story of lost love. Perkunas, God of Thunder, was the father God and his daughter was Jurate, a mermaid who lived in an amber palace in the Baltic. One day a fisherman named Kastytis would cast his nets to catch fish from Jurate’s kingdom. The goddess sent her mermaids to warn him to stop fishing in her domain. He did not stop, so Jurate went herself to demand he stop. Once she saw him she fell in love and brought him back to her amber palace. Perkunas, knowing Jurate was promised to Patrimpas, God of Water, was angered to find his daughter in love with a mortal. Perkunas destroyed the amber palace with a bolt of lightening to kill her mortal lover. Her palace was destroyed and Jurate was chained to the ruins for eternity. When storms in the Baltic stir the sea, fragments from the amber palace wash up on shore. Pieces in the shape of tears are particularly treasured, as they are the tears from the grieving goddess, as she weeps tears of amber for her tragic love. Because I am such a romantic I love mixing it with turquoise and for me amber is reminiscent of the sun in the sky. It also has been said to hold the healing properties from the tree essence, whichever tree it is made up of. So until my heart changes direction…. I remain pretty in amber. This entry was posted in love and poetry and tagged amber, gems, gold;, jewellery, love, poetry, red jade, relationships, Simply Rouge, stones, women. Bookmark the permalink. Beautiful! amber is one of my favourite stones and did not know about the healing aspects! It has several Jules.. always a pleasure to wear..
Estee, your amber works are beautiful! Thank you Tazzy.. that’s very sweet.